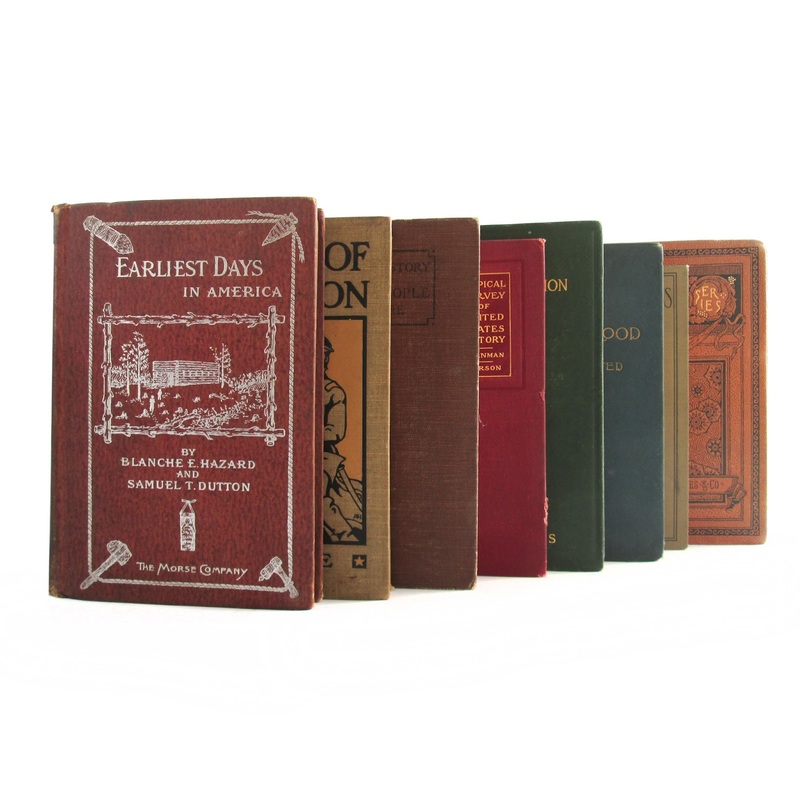 THE WORTH WHILE SERIES WORTH WHILE AMERICANS FOR THE GRADES Sparks, Edwin Erle F. M. Ambrose Company Good 1925 This 5.5"x7.5" hard cover book has a brown cover with black lettering on the front and spine of the cover. Black and white illustrations throughout the book. 296 pages. Book is in good condition with tanned pages, wear and soil. AN INDUSTRIAL HISTORY OF THE AMERICAN PEOPLE Moore, J.R.H. 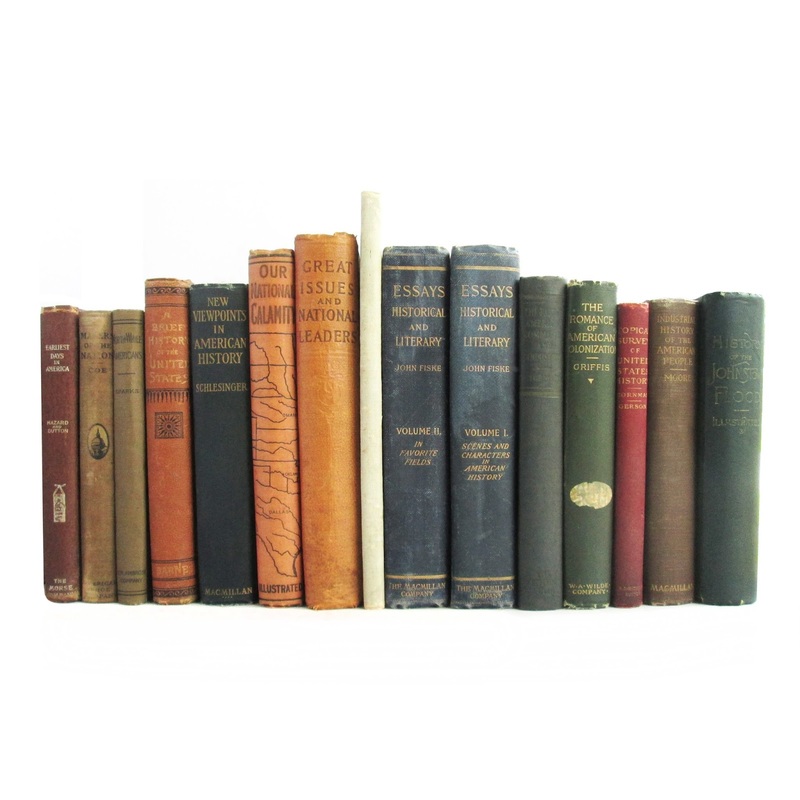 The MacMillan Company Good 1913 This antique hardcover book has a brown cloth cover with black lettering on front cover, bright gilt spine lettering. Owner's name on front endpaper; "Sample Copy" stamp on title page, faded and cocked spine, wear and soil. A history of American industry, illustrated throughout w/black-and-white photos. 496 pages, plus ads; approx. 5"x8". MAKERS OF THE NATION Coe, Fanny E. American Book Company Good 1914 This 5"x7.5" ANTIQUE, HARD COVER BOOK has a brown and black illustrated cover with black lettering on the front and spine of the cover. Many black and white drawing and photo illustrations all throughout the book. A book about the industry, businesses, and people of America's up-bringing. 384 pages. Book is in good condition with discolored spine, some foxing, wear, and soil. 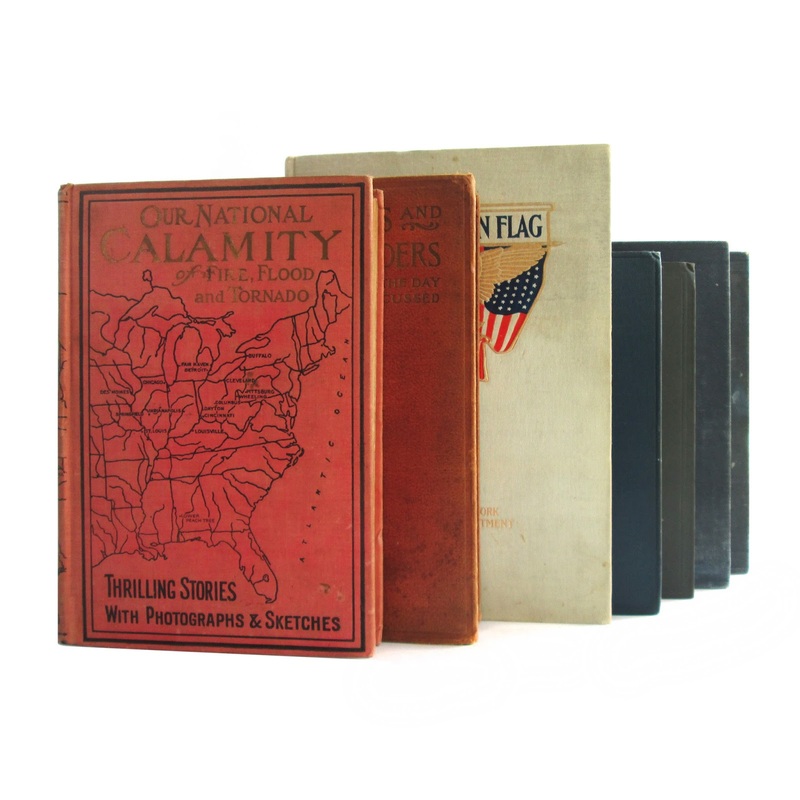 THE AMERICAN FLAG Horner, Harlan Hoyt Education Department Good 1910 This 7"x10" ANTIQUE, HARD COVER BOOK has a grey cover with blue and gilt lettering on the front and spine of the cover. There are stains on the first pages, tanning to the endpapers and innerboards, cracked front hinge, wear, and the cover has soil. A book about the history of the American Government. 110 pages. Ex-library copy. 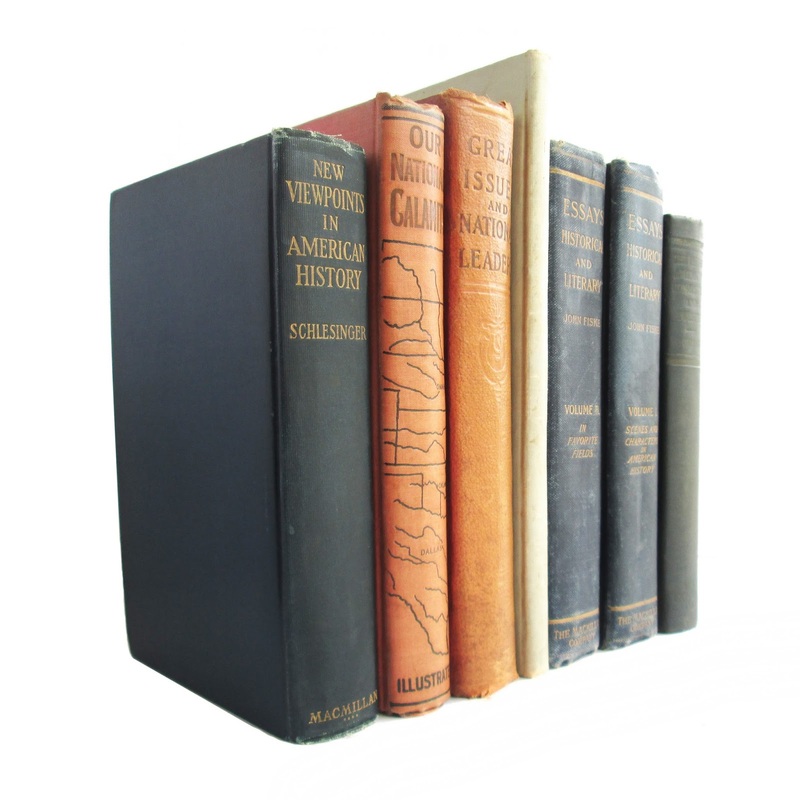 A BRIEF HISTORY OF THE UNITED STATES Various A.S. Barnes and Copmany Good 1885 This antique hardcover book is bound in brown boards with decorative black designs on the cover and spine, and decorative bright gilt lettering. Book is in good condition with owner's name, faded spine, wear, and soil. Color maps and illustrations. 362 pages, including index; approx. 6"x8". THE TRUE STORY OF OUR NATIONAL CALAMITY OF FLOOD, FIRE AND TORNADO Marshall, Logan L.T. Myers Good 1913 This antique hardcover book is bound in light red cloth boards with gilt lettering on the front and spine and a black etched map of the United States that wraps around onto the spine from the front cover. 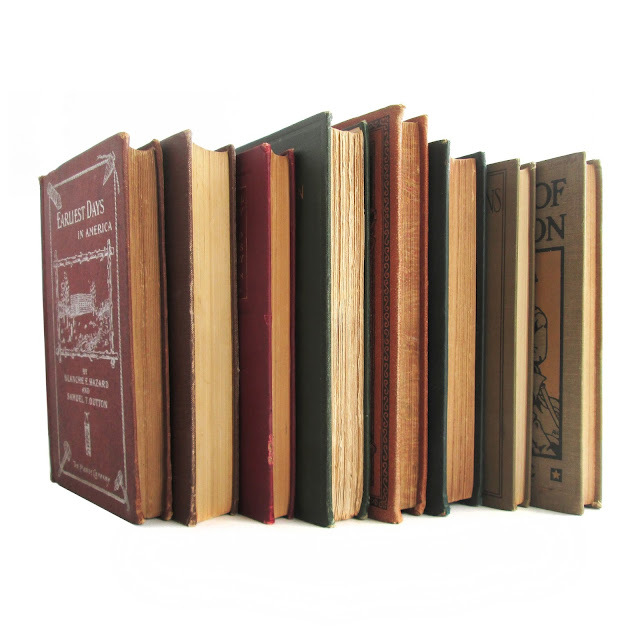 Spine is browned; owner's name, tanned pages, wear and soil. Illustrated with black-and-white photos and drawings, this book looks at natural disasters that struck the United States in 1913 and thereabouts, including massive flooding and tornadoes in the Midwest and Northeast. 352 pages; approx. 6"x8". 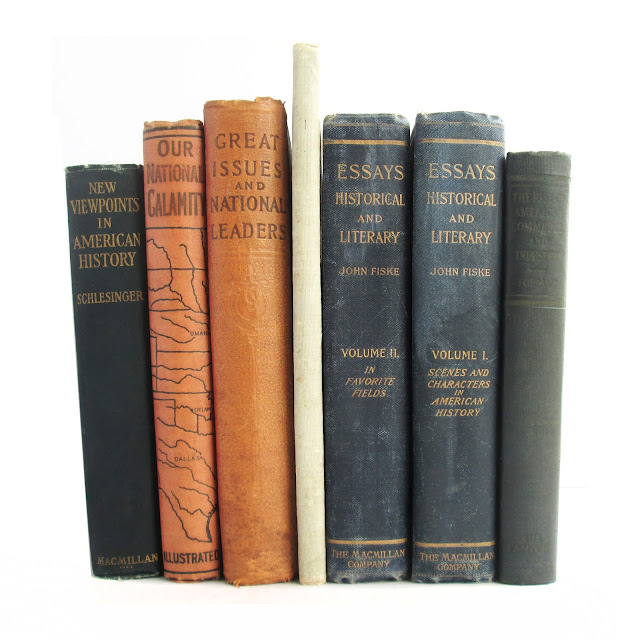 GREAT ISSUES AND NATIONAL LEADERS: LIVE QUESTIONS OF THE DAY DISCUSSED Morris, Chalres; Ellis, Edward The John C. Winston Co. Fair 1900 This antique hardcover book is bound in brown cloth boards with dark brown lettering on the front and spine. Edgewear; cover soil; spine is faded ; page edges browned, with soil; foxing; fading to the cover; weak rear hinge. 527 pages; approx. 6"x9". THE ROMANCE OF AMERICAN COLONIZATION Griffis, William Elliott W.A. Wilde and Co. Fair 1898 This antique hardcover book is bound in dark green cloth boards, with gilt lettering and gilt top page edge. Ex-lib., with typical lib. markings; cover wear; pages browned at edges, wear and soil. Illustrated with black-and-white plates. 295 pages; approx. 6"x8". New Viewpoints in American History Schlesinger, Arthur Meier The MacMillan Company Good 1923 This 5.5 x 8.5 hardcover has 299 pages. There is the owner's name on the front innerboard and endpaper, tanned pages, some markings, faded spine, wear and soil. A comprehension of the United States of to-day, an understanding og the rise adn progress of the forces which have made it what it is, demands that we should rework our history from the new points of view afford bu the present. A Brief Topical Survey of United States History Cornman, Oliver P; Gerson, Oscar D. C. Heath and Co. Good 1901 This is a brief topical survey of US history. 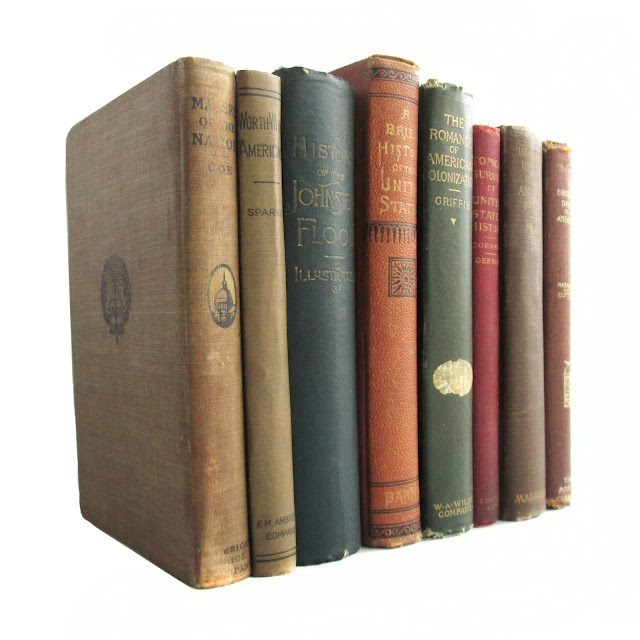 Book is in good condition with owner's name, light foxing, wear and soil. 186 pages plus constitution and ads. 7.5 x 5. Essays Fiske, John The MacMillan Company Fair 1902 This is a 2 volume set of historical and literary essays by John Fiske. 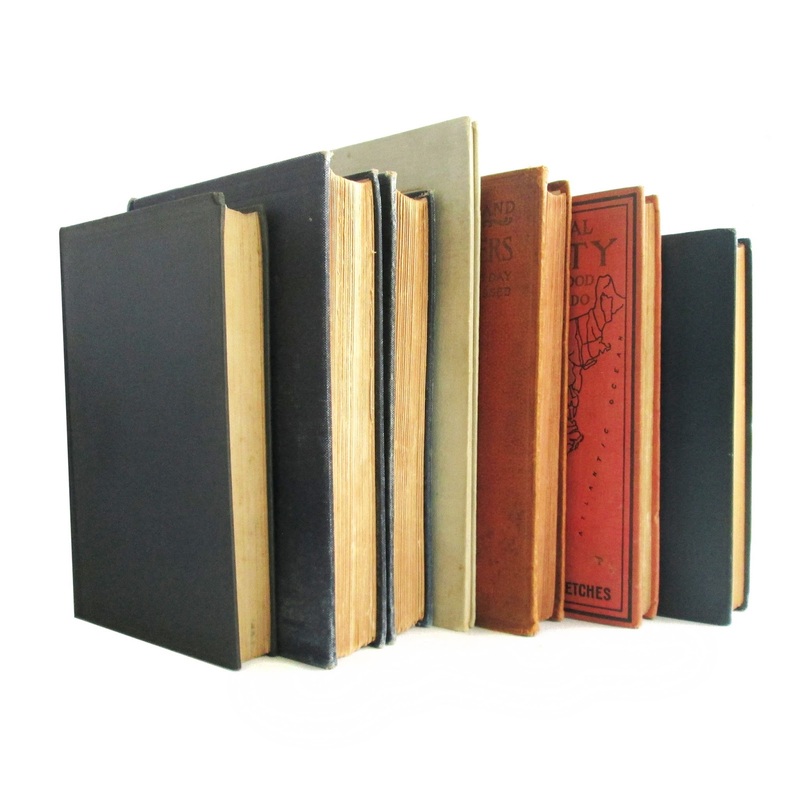 Books are in good condition with owner's name, edgewear, soil, browned page ends, weak hinges, white spots to the covers and some bubbling to the back cover of volume 2. About 400 pages each, 6 x 9. History of the Johnstown Flood Johnson, Willis Fletcher Edgewood Publishing Co. Good 1889 including the fearful record; the breaking of the south fork dam; the sweeping out of the conemaugh valley; the overthrow of Johnstown; the massing of the werck at the railroad bridge; escapes, rescues, searches for survivors and the dead; relief organizations, stupendous charities, etc, etc. with full accounts also of the destruction oon the Susquehanna and Juniata Rivers, and the Bald Eagle Creek. Illustrated with photos, drawings and maps. 459 pages. Boards worn at spine ends and corners. The Rise of American Commerce and Industry Forman, S. E. The Century Co Good 1927 Page end soil, inside is clean. Very slight wear to cover. 500 indexed pages. Earliest Days in America Hazard, Blanche E.;Dutton, Samuel T. The Morse Company Fair 1897 Illustrated. Frontispiece has been removed. Some stains and spine ends are worn. Some pencil markings. 262 pages. 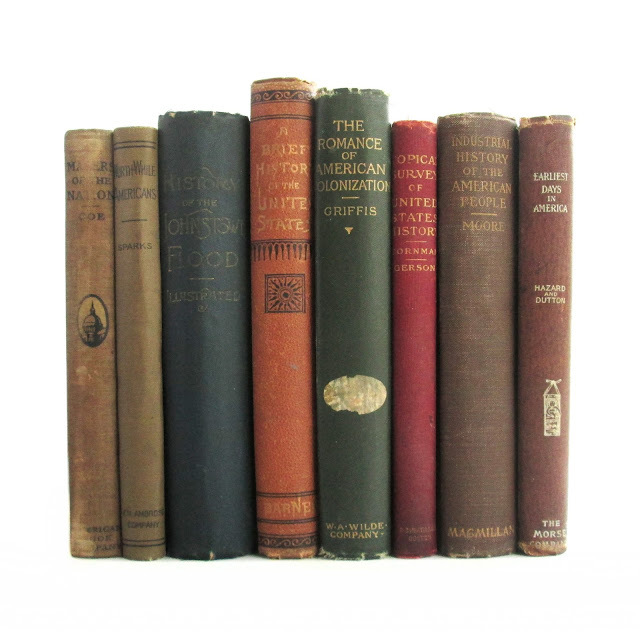 Collection of fifteen antiquarian and vintage American history books. Many have decorative bindings, illustrations and maps. These hardcovers show some wear and soil, detailed descriptions below. Total size of the collection is approximately 17" x 8" x 5"